Ms. Carroll has been the Director of the Franklin County Office on Aging (FCOA) since 1984. The role of the Office on Aging has expanded significantly, since 1993, when the first Senior Services levy program, Senior Options, was implemented. The senior services levy, first on the ballot in 1992, has regularly won by large voter margins. Ms. Carroll is a Licensed Social Worker and has a Master’s degree in Public Administration from The Ohio State University. 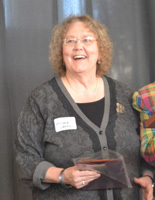 Ms. Carroll taught Social Policy and Aging for the Gerontology Program at Columbus State Community College, and Public Policy and Aging at OSU. Ms. Carroll lives in the Eastmoor area of Columbus with her husband Ronald Botts and their three cats. Ron is a pastor with the United Church of Christ, and he currently serves Highlands Presbyterian Church in the Worthington area. Both Ms. Carroll and her husband have been caregivers for their mothers who suffer from dementia.